Dedicated to caring for and protecting your crops to produce a better quality of food. 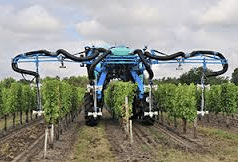 In today’s world, with its growing population and yet finite acreage available for farming, the crop sprayer is an essential tool to aid farmers achieve this goal. BERTHOUD has been innovating for over 100 years to provide our customers with accurate, reliable, high-performance crop sprayers. Using cutting-edge technology to create products in compliance with international standards for integrated farming methods which respect our environment and the quality of our crops.